With just seven games remaining, it's the part of the season when excitement amongst the fans and the media really amps up. But is it the same for the MK Dons squad? Dons currently sit third in the table with 21 points remaining, 10 points behind leaders Lincoln, two points behind Bury in second and three clear of Mansfield in fourth. For manager Paul Tisdale, the final seven games are about to show the culmination of a season's work as he aimed to avoid a third consecutive League 2 play-off campaign. “It's a type of excitement,” he said. “We do this because we enjoy it, it's exciting but stressful too. You have to keep control of it though and make good decisions. I have to keep a clear head. 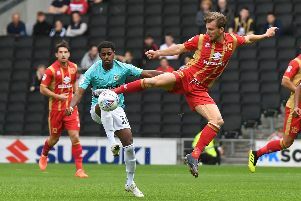 For striker Robbie Simpson though, he still looks at the business end of the season like a fan, eager to play every game as quickly as possible, but knows he has to remain level-headed and professional. Simpson said: “I look at it from a fan's point of view. I chat to fans, I ask them how they're feeling, and to get that,it gives me something. Players do react to fans, and the atmosphere they create. “These last seven games, it creates a feeling like no other job can, we have to thrive and really enjoy it. “The resounding feeling is excitement – they're the games we want to play in. We're not looking at Mansfield on the last day – which could be winner takes all. We're not that far ahead, it could be detrimental. We're thinking about Forest Green.